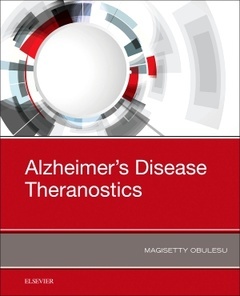 Alzheimer?s Disease Theranostics discusses the latest information on recent theranostic avenues for both the diagnosis and treatment of Alzheimer?s patients. It presents the pros and cons of the probable mechanistic role of nanoparticles in crossing the blood-brain barrier and improving disease symptoms. Finally, it highlights the merits of existing maneuvers and suggests perspectives to aid in future developments. Despite the difficulty of drug delivery to the brain, there are some nanoparticulate platforms demonstrating promise in treating neurodegenerative disorders such as Alzheimer?s disease. Manifold theranostic maneuvers include antioxidants, natural bioactive compounds, gene therapy, and nanotechnological approaches, all of which are discussed in this important work. M. Obulesu is a Scientist in ATG Laboratories, Pune, India. He has 18 years of research and teaching experience. His research areas are multifarious which include food science, pathology of Neurodegenerative diseases such as Alzheimer’s disease and designing polymer based Biomaterials (Design of hydrogels etc.). He did Alzheimer’s disease research and developed an aluminium induced neurotoxicity rabbit model. His present research focuses on development of redox-active injectable hydrogels of polyion complex. His research area also includes development of metal chelators to overcome metal induced toxicity. He is the first and corresponding author for majority of his articles. He secured a certificate from Stanford University for the Scientific Writing course. He is on editorial board of a few pathology journals such as Journal of Medical Laboratory and Diagnosis, Journal of Medical and Surgical Pathology, Annals of Retrovirals and Antiretrovirals, Kenkyu Journal of Medical Science and Clinical Research, SciFed Oncology and Cancer Research Journal, Journal of Cancer and Cure. He is also on editorial board of nanotechnology journals such as SciFed Nanotech Research Letters, SciFed Drug Delivery Research, Current Updates in Nanotechnology and Journal of Nanotechnology and Materials Science.